As many of you know the wartime film “Since You Went Away” (1944) is one of my all time favorite movies. It has everything: An excellent cast filled with cameos, poignant moments, and magnificent camera work. 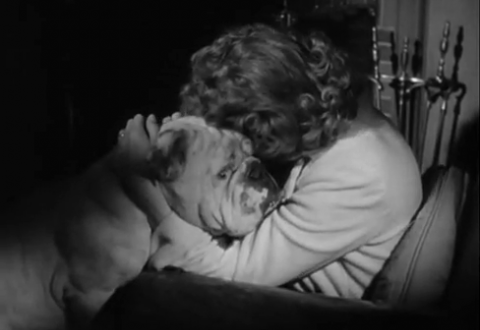 But one of my favorite things about the film is the Hilton’s English Bulldog Soda. Soda plops himself on a map as Col. Smollett and Bridget look for her father’s military base. The movie revolves around Ann Hilton (Claudette Colbert), her two daughters Jane and Bridget (Jennifer Jones and Shirley Temple), their boarder Col. Smollett (Monty Wooley) and a slew of other characters that move in and out of their lives. However, though Soda is just their pet, he still plays an instrumental role in the film-he even has his own theme music during the movie. When ever Soda has an appearance, a little tune is played by an oboe. Soda seems to respond or foreshadow the main characters emotions throughout the film. •When we enter the film, Ann is coming back from seeing Mr. Hilton off to fight in the war. Soda is lying sadly, flat on the floor in front of his Mr. Hilton’s favorite chair. One of his owners has left him. Jane and Bridget come home from school and Mrs. Hilton tries to put on a happy front for them. But her daughters start to cry, because they realize nothing will be the same without their dad. At this moment, Soda trots into the room-sensing his family is sad and he needs to be with them. Soda hops up on to Mr. Hilton’s bed and rests his head on his master’s robe. •Another moment the girls are gathered around their mother as she reads a letter from Mr. Hilton. Soda is laying near the chair with her as if he is listening too. •The Hilton’s rent the master bedroom to a boarder while trying to make ends meet without Mr. Hilton’s salary. Col. Smollett ends up renting the room. Smollett is very particular- he wants his eggs boiled exactly at 2.5 minutes and is irritated by the laundry hanging in the bathroom-among other things. It comes to no surprise that he has a low tolerance for dogs. So of course, Soda attaches himself to Smollett, much to his dismay. The Colonel announces his displeasure for the dog right when he comes into the house. Soda pestering Col. Smollett during a game of charades. Soda is protecting his family against this strange man in their household, but Soda gets more friendly towards Col. Smollett-as Smollett does towards Soda. At first he complains about the dog and doesn’t like how Soda follows him around. At his birthday party, Soda begs for cake beside Smollett’s chair. During a game of charades at the Christmas party, Smollet is lying on the floor, and Soda walks up and starts licking him on the face. Though Col. Smollett won’t admit it, he likes Soda’s company towards the end of the movie and even calls him when its time to go to bed. •Soda seems to be in tune with what is going on around him and his family. Like I mentioned earlier, he is aware when his master has left, but he is also aware when Mr. Hilton is in danger. Mrs. Hilton receives bad news about her husband from the War Department. That night, she sits in her husband’s chair and looks through their scrap book which includes a dance card from the night they were engaged, the horoscope for the day they were married and their daughter’s birth announcements. As Ann Hilton starts to cry, Soda trots into the room, puts his front paws on the chair and she hugs Soda as she sobs. On Christmas Eve, Mrs. Hilton gets a telephone call with a cable gram message containing good news about her husband. As Mrs. Hilton happily calls out to her daughters that their father is coming home, Soda perks up from his spot in bed with Col. Smollett, barks and runs to join his family. Though several of Soda’s scenes are rather emotional, Soda also offers a good bit of comic relief. Some of the funny scenes are when he is bothering Col. Smollett. My personal favorite is when Soda is sitting on the front lawn and the sprinkler turns on, he runs away and shakes himself. Unfortunately, the scene directly after this is when Mrs. Hilton gets a message from the War Department. Soda’s water sprinkler scene gives us a false sense of security and happiness with the Hilton family, but also offering a funny moment before we receive bad news. Though Soda isn’t the star of “Since You Went Away,” his performance is as enjoyable as the cameos of Guy Madison, Keenan Wynn and Lionel Barrymore. He is my personal favorite movie dog, and I’d like to name a dog ‘Soda’ after him. Soda is aware of his surroundings and family’s emotion during wartime and tries to take care of them. This entry was posted in Reviews and tagged English Bull Dog, since you went away, Soda by Jnpickens. Bookmark the permalink. Jessica – this is such a cute post! Soda is a very expressive performer and quite a gentleman. 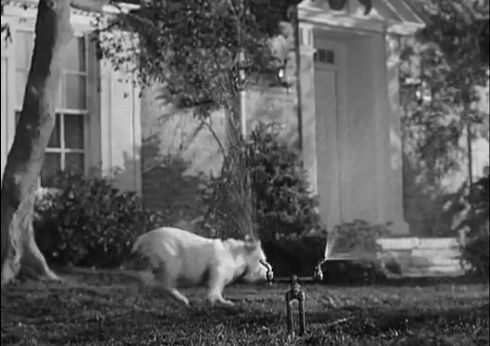 He, like so many dogs, is a major member of the cast and really should be listed prominently in the credits. Awexome job! I loved this dog and this film very much. I especially loved his gradual devotion to Monty Woolley’s character. I haven’t seen “Since You Went Away” but I had to tell you how awesome your post is. I loved all the photos with the beautiful scene stealer Soda. 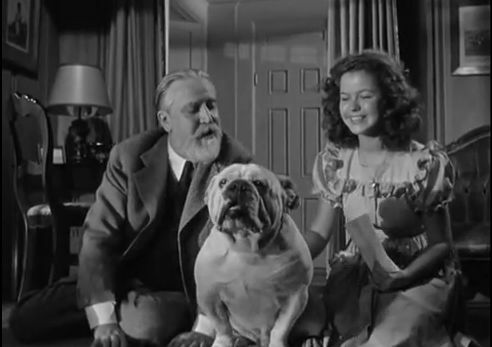 I am quite a fan of the very talented Monty Woolley (especially in “The Bishop’s Wife” and “The Man Who Came to Dinner.”) I will make a point to look for this film as I am also especially fond of movies with dogs. Great job! As I mentioned on Twitter, I really enjoyed this post. You did a great job highlighting how effectively Soda was used to heighten dramatic moments, along with helping to convey the Hiltons’ family life. 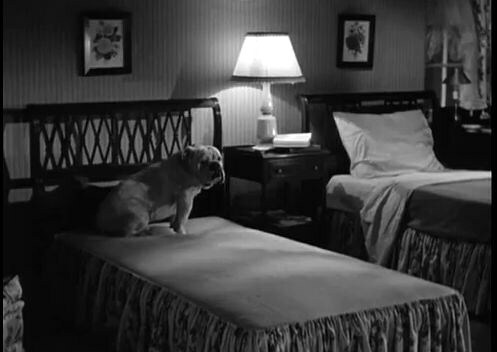 And when by the end the Colonel calls Soda to go to bed with him…awwwww! Love the film and love Soda. You are right about him having some key moments in the film. Thanks for choosing him for the dogathon! Soda is such an intuitive dog. He is both comical relief and a should to cry on for Hilton women. Nice choice for the Dogathon. I love Since You Went Away. I haven’t seen this movie for about 3 years…your post reminded me that it’s time for a re-watch. I think “Soda” is a great name for a dog. Just think, if you got a dog and named him that, you would have a great opener for discussing classic movies with people. They’d wonder why you named him “Soda” and you could share about the movie. Jessica ~ an excellent “doggie-eyed” review of a lovely and touching film. I especially liked your depiction of Soda’s empathy for his people’s emotions as they brave the pain and uncertainty that faces them. He is, after all, the man of the house in the absence of his master, and he must be keenly aware of the loss. 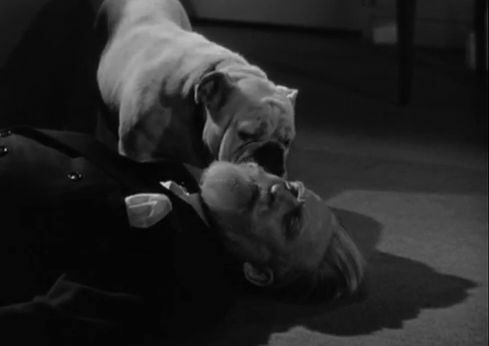 I don’t know who I think is cuter, Monty Woolley or Soda, but it was inevitable each would adopt the other, after a few trials and tribulations. I agree Soda is an inspired name for a dog, now if only they had a cat named Whisky. Jessica, this was a warm, endearing review of SINCE YOU WENT AWAY focusing on the canine protagonist of the film. I loved the part where you described Soda slowly deciding that Colonel Smollett was okay and then attaching himself to him. Dogs do indeed decide who they like on their own. And I’ve known more than one person who tried to resist the charms of a dog and was eventually won over. A delightful choice for the Dogathon. We want a dog just like Soda. This was a good review. I love this movie too, Jessica, and one of the best aspects is the relationship between Col. Smollett and Soda. Hilarious, and sweet too. English bulldogs are so funny-looking they always make me smile. I really enjoyed your run-through of the movie and comments about Soda. Good job! Soda, dog that was in that movie, could not begin to measure up to my Joe (a lovable sheltie). But I like that your blog has gone to the dog! Jessica, I’m a big fan of Claudette Colbert, and this is one of my two favorites of her non-comedy roles. (The other is “Three Came Home.”) But the movie has a lot more going for it than just the wonderful Colbert, including Soda. In some ways the film is about how a group of people create a temporary family to substitute for the one disrupted by wartime, and there’s no denying that Soda is a real member of that family. I especially like the way you didn’t just write a general post about “Since You Went Away” but organized the entire post around the way Soda is an important part of the plot–almost a canine “chorus”! A great job, and certain to influence the way I watch the film the next time I see it. I’m in love with Soda now! But, I have yet to see this film. I knew little about it and it always sounded like too much of a tear jerker. You spiked my interest. Ok Jessica, I selected you for Six Degrees. If I haven’t already harassed you on Twitter, then let this comment get you started. If You loved Since You Went Away, please try some other home front war classics such as Pride Of The Marines, Tomorrow Is Forever and The Best Years Of Our Lives. I love that you created this for Soda!! I’ve always wondered what was his real name and who trained that little doggy actor? !